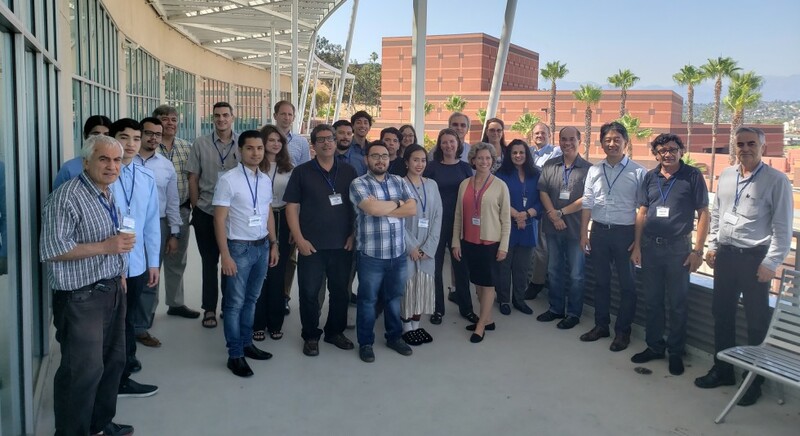 The Cal State LA PREM program, in partnership with the MRSEC Center for Nanoscale Science at Penn State University (PSU), enhances the research and education of students in materials science and engineering at Cal State LA. Its focus is on mentoring, guiding, and training undergraduate and master’s students for careers in the field via a comprehensive scientific and educational program. Research projects students undertake provide them a broad interdisciplinary experience in materials science in chemistry, physics, and mechanical engineering thereby reflecting the current research and development industrial environment. The newly established Master’s of Science Degree in Materials Science and Engineering will serve as a bridge for Cal State LA students to continue on to PhD studies at PSU or other leading institutions, or seek employment in the field after graduation. PREM faculty, students, and external advisory board at the August, 2018 summer retreat. To enhance the materials science and engineering research and educational program at Cal State LA by initiating a long-lasting collaboration with PSU and its Center for Nanoscale Science (an NSF MRSEC) leading to the creation of a Master of Science Degree in Materials Science and Engineering at Cal State LA. To recruit, retain and provide a means for minority students to pursue graduate degrees in materials research. To develop highly trained undergraduate and MS graduate students for careers in materials research via a comprehensive program involving scientific research, workshops, and faculty mentoring. To involve talented high school students from local minority schools to conduct summer research experiences at Cal State LA. To expose students to the collaborative nature of the scientific enterprise by bringing together a core group of faculty from two institutions whose scientific pursuits complement each other and which are interdisciplinary in nature. To strengthen the core faculty conducting research in materials science and engineering with a long-term goal of broadening the materials science and engineering capabilities of the institution across multiple disciplines. To address scientific problems necessary to solve critical societal needs of the 21st century. The Cal State LA-PSU PREM is a synergistic and interdisciplinary approach to carrying out materials science and engineering research and education activities. Frank A. Gomez (Cal State LA), Vincent Crespi (PSU), and a team of Cal State LA and PSU scientists and engineers with backgrounds in chemistry, physics, mechanical engineering, and materials science and engineering, work collaboratively focusing on fundamental research projects in materials science and engineering. A main focus of the partnership is the establishment of a Master’s of Science Degree in Materials Science and Engineering at Cal State LA, which will remain an asset to the university well beyond PREM funding. A rigorous student-centered educational program consisting of mentoring, advising, a yearly PREM retreat, and a high school program, will increase the pool of well-prepared students for careers in materials science and engineering. Fundamentally, this partnership will enable the development, discovery, and application of new materials and materials properties that are important to solving current societal problems. Students at Cal State LA and PSU work with some of the best professors at Cal State LA and PSU engaging in the discovery, development and application of new materials. Students are given the opportunity to publish their research and receive training that will help them move seamlessly on to Ph.D., professional, and other graduate programs, and into the work force. President William Covino opening up the PREM Retreat. Recent work from PREM laboratories. The PREM program at Cal State LA has seed grant opportunities for faculty members interested in Material Science! Please contact Nafiseh Sehat at nsehat2@calstatela.edu or Dr. Frank A. Gomez at fgomez2@calstatela.edu for more information! PREM has paid stipend and volunteer opportunities available! Please contact Nafiseh Sehat at nsehat2@calstatela.edu or Dr. Frank A. Gomez at fgomez2@calstatela.edu for more information! Good luck to all of our students taking the GRE & applying to Ph.D. and Grad programs!